The Wenger Urban Classic collection is an emotional appeal to active people caring about harmony, well-being and true values, with a subtle touch of nostalgia. Clean and sober designs combine excellent legibility in the dark with Superluminova coated hands and markers. The Urban Classic line is designed in 44mm and 43mm diameter chronographs, as well as in 42, 41 and 34mm diameter for the 3-hands versions. 100m water resistant. 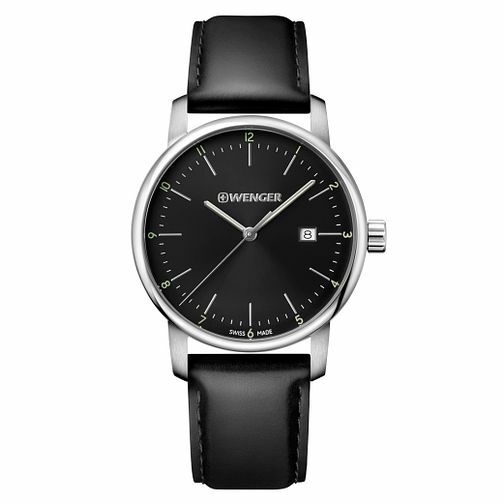 Wenger Urban Classic Men's Black Leather Strap Watch is rated 5.0 out of 5 by 1.